Note: these rates are made available exclusively for Hartford Schools through Hartford Performs, and represent approximately 25% of the RapOet's normal fees. Materials Arts Provider Provides: Provides: If the above materials are not provided by the school, the RapOet will gladly bring: Laptop, speakers, paper, and utensils. Smartboard with sound (or speakers for the Artist’s laptop), paper and pens/crayons for each student, ability to connect a USB drive to the computer with Smartboard. Space and/or Set Up Requirements for Program: Flexible, but preferably a room where students are allowed to be somewhat louder than usual. Program Learning Objective: I CAN describe how a classroom is similar to a performance space. I CAN make connections between rap music and other content areas that I'm currently studying. 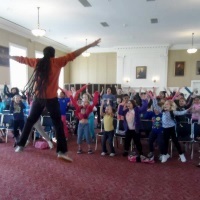 Program Description (Grade Level Program): A streamlined version of the critically acclaimed RapOetry Workshop involving 4 sessions per class (and an optional recording session for exceptional students). During creation of a collaborative performance piece (in the genre of Rap/Hip- Hop/Spoken Word poetry) students increase awareness of how rhythm (the use of repetition, tempo, and order) is used to enhance poetry, music, and even communication between students and teachers. - Day 1: Use a range of traditional and electronic sounds for composition. - Day 2: Compare spoken and written text, and then choose the words appropriate for their message. - Day 3: Revise word placement and stress to increase understanding of how poets alter meaning through figurative language, puns, and poetic license. - Day 4: Use vocal, facial, and physical performance cues. Within schools participating with more than 55 students, the host teacher helps select students who are ready to record. The RapOet returns on a separate day to guide selected students through a 90-120 minute recording session. Parent Engagement Opportunities: The RapOetry Workshop has opportunities for caregivers to be involved as audience members for Solo and Live Band performances. As for workshops and residencies, 1 focused and considerate caregiver per each 12 students in the class may assist with photographing, videotaping, and of course... participating in fun activities! Grade 5: Reading Standards for Literature: Craft and Structure # 4: Determine the meaning of words and phrases as they are used in a text, including figurative language such as metaphors and similes. Grade 5: Language Standards: Knowledge of Language # 3: Use knowledge of language and its conventions when writing, speaking, reading, or listening. a. Expand, combine, and reduce sen- tences for meaning, reader/listener interest, and style. b. Compare and contrast the varieties of English (e.g., dialects, registers) used in stories, dramas, or poems. Grade 5: Music: Creating Anchor Standard 3.1: Refine and complete artistic work. a Evaluate, refine, and document revisions to personal music, applying teacher-provided and collaboratively-developed criteria and feedback, and explain rationale for changes. Grade 5: Music: Performing Anchor Standard 4.3: Select, analyze, and interpret artistic work for presentation. a Demonstrate and explain how intent is conveyed through interpretive decisions and expressive qualities (such as dynamics, tempo, timbre, and articulation/style). Grade 6: Reading Standards for Literature: Craft and Structure # 4: Determine the meaning of words and phrases as they are used in a text, including figurative and connotative meanings; analyze the impact of a specific word choice on meaning and tone. Grade 6: Music: Creating Anchor Standard 3.1: Refine and complete artistic work. a Evaluate their own work, applying teacher-provided criteria such as application of selected elements of music, and use of sound sources. Grade 6: Music: Performing Anchor Standard 4.3: Select, analyze, and interpret artistic work for presentation. a Perform a selected piece of music demonstrating how their interpretations of the elements of music and the expressive qualities (such as dynamics, tempo, timbre, articulation/style, and phrasing) convey intent. Grade 7: Reading Standards for Literature: Craft and Structure # 4: Determine the meaning of words and phrases as they are used in a text, including figurative and connotative meanings; analyze the impact of rhymes and other repetitions of sounds (e.g., alliteration) on a specific verse or stanza of a poem or section of a story or drama. Grade 7: Music: Creating Anchor Standard 3.1: Refine and complete artistic work. a Evaluate their own work, applying selected criteria such as appropriate application of elements of music, including style, form, and use of sound sources. Grade 7: Music: Performing Anchor Standard 4.3: Select, analyze, and interpret artistic work for presentation. a Perform contrasting pieces of music demonstrating their interpretations of the elements of music and expressive qualities (such as dynamics, tempo, timbre, articulation/style, and phrasing) convey intent . Grade 8: Reading Standards for Literature: Craft and Structure # 4: Determine the meaning of words and phrases as they are used in a text, including figurative and connotative meanings; analyze the impact of specific word choices on meaning and tone, including analogies or allusions to other texts. Grade 8: Language Standards: Knowledge of Language # 3: Use knowledge of language and its conventions when writing, speaking, reading, or listening. a. Use verbs in the active and passive voice and in the conditional and subjunctive mood to achieve particular effects (e.g., emphasizing the actor or the action; expressing uncertainty or describing a state contrary to fact). Grade 8: Music: Creating Anchor Standard 3.1: Refine and complete artistic work. a Evaluate their own work by selecting and applying criteria including appropriate application of compositional techniques, style, form, and use of sound sources. Grade 8: Music: Performing Anchor Standard 4.3: Select, analyze, and interpret artistic work for presentation. a Perform contrasting pieces of music , demonstrating as well as explaining how the music’s intent is conveyed by their interpretations of the elements of music and expressive qualities (such as dynamics, tempo, timbre, articulation/style, and phrasing).